"Scandal" by Lola Ridge was offered by Poets.org's Poem-A-Day on March 2, 2014. A link to the poem may be found here: https://www.poets.org/viewmedia.php/prmMID/23903. 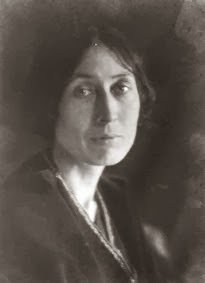 Lola Ridge (1873 - 1941) (pictured) was the author of several published poetry collections and the recipient of a Guggenheim Fellowship. She was employed as a factory worker in New York City, and was a champion of women's rights, gay rights, and immigrant rights. Additional biographical information may be found here: https://www.poets.org/poet.php/prmPID/2248?utm_source=PAD%3A+Scandal+by+Lola+Ridge&utm_campaign=poemaday_030214&utm_medium=email. The poem is presented in twelve lines of irregular free verse. The speaker laments that there are more important matters that should receive attention rather than a scandal.